As the sun is steadily getting lower around the north pole of Mars, the Mars Phoenix Lander has managed to scoop soil into its sixth oven out of the eight that came with TEGA, the thermal and evolved-gas analyzer. Now there are two ovens left, and hopefully the lander will be able to make use of them before the sun drops below the horizon for the winter. Meanwhile, the lander would also serve as a weather station observing snow falling and clouds in the sky. And what is going on with the mystery of the unexpectedly dry Martian soil? With enough water on Mars to form frost and clouds, direct visual evidence of water ice, and water apparently responsible for the clumpy Martian soil, one would think that there would be the tiniest bit of free water molecules not bound up in ice in the soil of Mars. With even an extremely small amount of frozen water, it could be detected by measuring how well electricity flows within the soil. That is exactly what the Mars Phoenix Lander did by sticking electrical probes into the soil. Puzzlingly, the measurements seem to indicate that the Martian soil is extremely dry with no unfrozen water. Where is the missing water? Is it because it's so cold and the atmosphere so thin that water molecules would immediately be bound in ice or evaporated? Or is there actually unfrozen water in the soil, but some special chemical property of the soil affects the electrical conductivity? I guess we'll hear what's likely from the Phoenix scientists soon enough. The Mars Phoenix Lander has a lidar used in meteorological research of Martian weather. A lidar is basically a radar which uses lasers instead of radio waves. It is used to study particles floating around the Martian atmosphere. It also gives an unintentional laser light show. While it's pretty bare-bones, it's somewhat awe-inspiring in that it's millions of kilometers away on another planet. 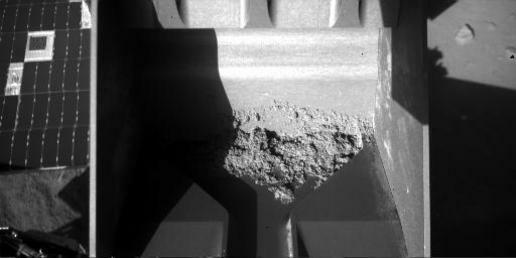 In other news, the lander has been able to get a tiny bit of water in the dirt sample that had previously been stuck on the scoop (apparently not all of the water ice sublimated away during the delay) and the Phoenix mission has been extended by 30 days, which gives extra time to fully utilize all of the ovens in the TEGA instrument and allows more extended observations of the weather changes near the Martian north pole. And there is also the good news that they won't have to worry about a possible short circuit dooming the mission as long as they don't overheat the instruments. The Mars Phoenix Lander has been thwarted yet again in its attempts to scoop up Martian soil into one of its lab instruments. You might remember the previous occasion when the soil was too clumpy to fall through the screen over the instruments. The same stickiness that made the soil clump together struck again in a worse way, where the soil wouldn't even drop from the scoop. One crazy idea why the Martian soil got stuck on the scoop is because of the slime oozed from Martian life. Of course, realistically it's the half-melted water getting frozen on the scoop, although there could be some other chemical phenomenon that is the cause. While the researchers hoped to have analyzed a sample with water ice mixed in, they'll be analyzing dry samples while they figure out how to get watery samples into the instruments. I hope a short circuit doesn't break the instruments before watery samples can be analyzed. This is yet another reason to send humans to Mars instead of just robots. With a human around, they could have just scraped off the dirt from the scoop, and we would probably done the same amount of science that the Phoenix has done so far weeks ago. I wish we had something like a space elevator to make space exploration much cheaper. The Mars Phoenix Lander has finally managed to shake some Martial soil into its laboratory instrument. The TEGA, the laboratory instrument on the lander, has eight ovens for baking soil to analyze the ingredients. When the robotic arm scooped up soil to one of the ovens a few days ago, the soil got clogged on the screen over the oven, preventing analysis. They finally managed to unclog the soil after applying a new method of shaking the screen. Continue reading "Baking Mars dirt"